Eagle Pack® Holistic Select® and Eagle Pack® Super Premium brands offer natural, human grade ingredients and the highest quality meat meals, grains, and fats and oils available. Both contain at least 8 of our holistic, custom supplements. To learn more about ingredients used in our foods, choose a product line (Holistic Select® or Super Premium) and follow the link to the respective "Ingredients" page. 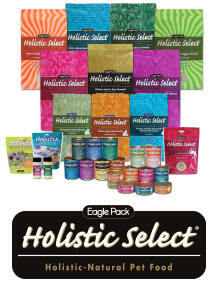 The Eagle Pack® Holistic Select® brand offers hypoallergenic formulas, unique ingredients such as duck, organic quinoa, a broader variety of fruits and vegetables and added holistic supplements. My pugs here are feed all kinds of different food. I like to try many different brands of food. But, they must have NO by-Products. I feel it is very important to feed a dog food free of harmful preservatives and By-Products. Only a trained eye and knowledge of these chemicals will they be recognized, often breeders are not aware and have chosen a dog food based on popularity. There is no such thing as a good By-Product or artificial preservative. Dog food is not FDA regulated so a By-Product can be anything from chicken feet to sawdust yes sawdust! We have done our research and feel that Eagle Pack Holistic dog food is an excellent brand of Dog food. I am also happy with LIFES ABUNDANCE AND ULTRA HOLISTIC. They have all passed by my standards to which I feel are very high. I have taken my time to research ingredients and the harmful effects that they have on dogs. You would not believe what goes into many so called top brands that claim to be premium foods. I will not name any names, but I assure you many are not what they claim. 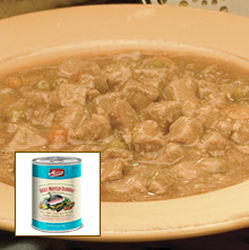 This dog food is as holistic as you get if you are not making the food yourself fresh out of your fridge. Did you know that some grocery store brands list real chicken and lamb as the first ingredient? They are fooling the customer for they count the weight of water so your dog is receiving 70% water and only 30% meat!! Some people are afraid to feed corn if properly ground and cooked 99% is easily digestible and is not the leading 7 list for allergies for dogs. Anchovy and Sardine are excellent sources for omega 3 and are pretty much free of mercury! The preservatives used are Vitamin C and Vitamin E. Not some harmful chemical known to cause cancer or birth defects in humans or animals. I find this dog food to be excellent and it shows in our dogs. I highly recommend this dog food to anyone. I have not had any problems with Eagle brand even with it having multiple sources for protein. I like the fact that Eagle is so well rounded with fresh never frozen ingredients that are slowly cooked to preserve freshness and flavor. Also there is Microbial that is excellent to aid in digestion and to help your puppy or dog absorb what he/she is eating better. A healthy gut insures the dog is absorbing what they eat. As well as chlorophyll to help keep your dogs teeth clean and breath fresh! 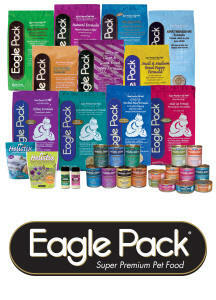 Eagle Pack Holistic Dog food is rated in the top 10 dog foods! The facility is USDA inspected where the dog food is made. Human Grade ingredients... This is very important in my book. “EXCELLENT food in my opinion”. 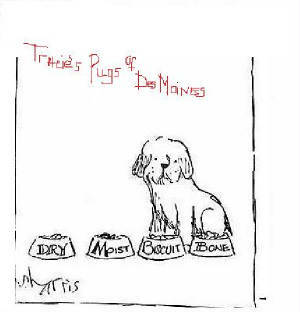 I, here at, Tracie’s PUGS OF DES MOINES, take the time needed to constantly research dog foods and feed only cutting edge nutrients to my dogs. If ever I feel there is another brand of food that would benefit my dogs better than what I am currently using I will feed it. I am very intense about my feeding program and insist on feeding only the best to my dogs. ~Overall Health begins with optimal nutrition, This I firmly believe in. 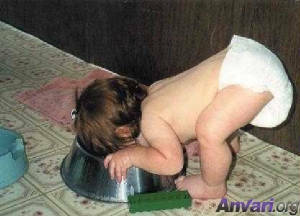 OTHER FOODS MY PUGS & HUSKY LIKE THAT I FEED ARE ULTRA DRY FOOD, SOFT MERRICK, SOFT EVANGER, and here is why! What’s Ultra Holistic Nutrition? It’s simply the best combination of holistic dog food ingredients that we could find. We know that dogs need protein and we’ve combined three animal proteins—chicken, lamb and salmon meals to provide essential amino acids for better muscle development and overall performance. Okay, we know you understand chicken and lamb, but why salmon? Well, salmon naturally contains essential amino acids like DHA. Dogs need animal proteins to grow and stay strong and it’s the combination of poultry, meat and fish that makes Ultra a protein-rich holistic dog food that your pet will gobble up. But, Ultra is more than protein. We know from experience that many essential nutrients can be found naturally in flowers, vegetables and grains. These days, more and more of us are becoming aware just how nutritious foods like tomatoes, cranberries and garlic are. Tomatoes contain Lycopene and Tomatoes provide vitamin C, both of these are powerful antioxidants. These antioxidants fight free radicals and help fight the effects of aging—that's something that all of us can appreciate. And by adding natural amino acids and omega-3 and omega-6 fatty acids from sunflower and fish oils, we've made a food that is not only rich in naturally occurring nutrients like DHA and linoleic acid, Ultra tastes great too. What good is a highly nutritious food if no one wants to eat it! We don’t want to brag—or maybe we do—but we’ve tested Ultra with dogs and found that more dogs prefer Ultra than other comparable brands*. 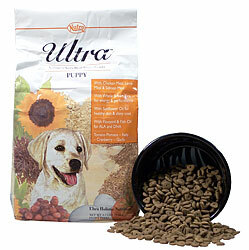 We know your dog’s biggest concern is taste and Ultra has the taste your dog will love! We know that your concern is whether your dog is getting the healthiest diet he or she possibly can. With Ultra, the answer is a resounding YES! The best part of Ultra is that you can see the difference. Healthy skin and a shiny, lustrous coat are one hallmark of an Ultra dog. We’ve also been told that dogs fed Ultra seem to be more easily trained with a better ability to understand commands. But the best thing is that a well-nourished dog is going to be a healthy and happy companion for you and your family. Oh, and lets not forget that Ultra contains absolutely no chemical preservatives—no BHA, BHT, ethoxyquin or propyl gallate. So you can be sure that you are getting a food that is good for your dog's sustained vitality and well-being. We think Ultra is the best formula for your dog's health and happiness—so we invite you to try it! Lifes Abundance Premium Dog Food contains only fresh, natural, wholesome ingredients. It provides 100% complete nutrition in accordance with AAFCO feeding protocols. This premium dog food is a high antioxidant formula and contains 3 sources of superior protein ... chicken meal, egg and fish meal plus carrots, apples and more. There is no corn, wheat, dairy, by-products, artificial colors or flavors in Lifes Abundance. To learn more and get free samples click on the bag of dog food above! Don’t see your brand of pet food? Here’s how to compare your brand to Life’s Abundance. 1. Get your bag of food. Look for the Ingredient Statement on the label. 2. Read the first 5 ingredients. They play a significant role in the nutritional make-up of a food. Life’s Abundance primary protein is chicken meal. Why? Because chicken meat contains a certain amount of moisture; however, chicken meal is a concentrated source of chicken protein because most of the water has been removed. Therefore, it stands to reason that you get a greater “protein content” in 1 pound of chicken meal versus 1 pound of chicken. Life’s Abundance lists only 1 grain in the first five ingredients, ground brown rice. Life’s Abundance does NOT contain by-products ingredients. What are the fat sources? Some fats are better than others. We believe the primary fat source in dogfood should be animal based because animal fats contain a profile of fatty acids that are easily metabolized and thus are generally more available to the body. Life’s Abundance contains chicken fat. Vegetables, Beet fiber, Antioxidants, Proteinated Minerals, Bacteria cultures. Your dog deserves the very best food. How does your food measure up?